In keeping with the tradition of posting the rad gifts I scored for my b-day, I've put together a quick list of this year's awesomeness. Mrs. Kyality got me "MINI Concept For The Future", which is the book that BMW put together commemorating the MINI Traveller Concept that the Clubman is based on. The Kyality Kids (with help from mom) got me L.L. Bean Day Sailor Sweater, the Threadless 108 References to LOST tee, "The Office" Christmas Special (British version of course) and Close Encounters of the Third Kind (30th Anniversary Ultimate Edition). Click here to enlarge the images above. 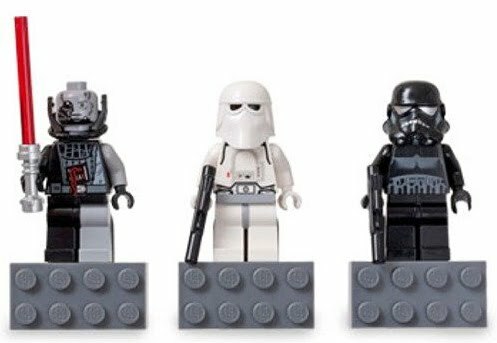 Oh yeah, and Upto12 also got me the LEGO Star Wars Mini Figures Magnet Set with Battle-damaged Darth Vader, Snowtrooper and Shadow Trooper.